Are you wondering what sort of gift you should bring to a gender reveal party? Read on to learn 20 unique gender reveal gifts- and discover what not to give! Your BFF is having a baby! That means you may be just about as excited as the mother-to-be! 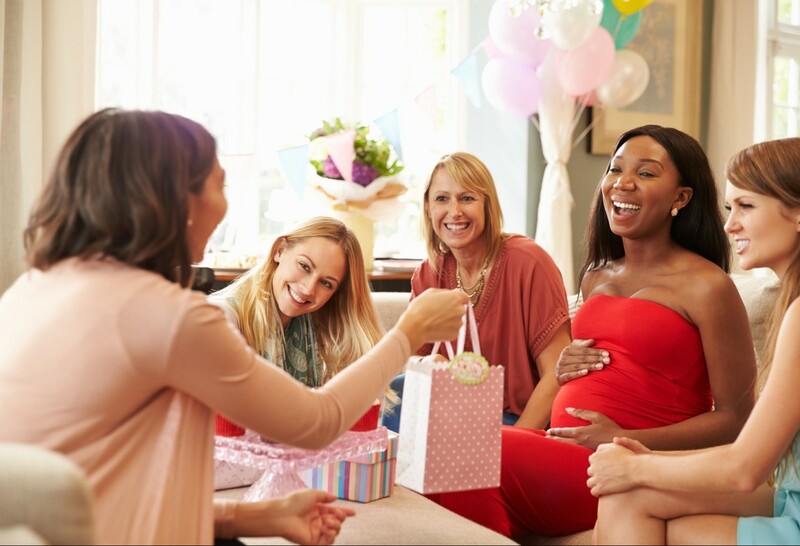 Whether you’re involved in the planning of the gender reveal party or not, you may be thinking of taking a gift. Gifts are always appreciated since that new mamma can use all the help she can get! You don’t want to take just any old gift though. You want something unique, something nobody else will have thought of. But what if you’re fresh out of ideas? No need to worry–we’ve got you covered. Here are 20 unique gender reveal gifts, plus some info on what not to bring! Who says the gift has to be for baby? That’s what the baby shower is for. Instead, surprise the lovely mother-to-be with some stylish new clothes. Your friend will love your thoughtful gift. It’ll help her be comfortable all throughout her pregnancy. Plus, every time she wears an item, she’ll think of you and your friendship! Buying clothes for others can be tricky, so make sure you know her size and preferences before you purchase the gift! If you’re worried the items may not fit, include a gift receipt. Every mama loves a little pampering while her precious little babe is cooking. A nice, soothing foot soak will really do the trick. Body pain is common during pregnancy. The least you can do it provide some relaxation while everyone awaits baby’s arrival. Foot soaks can be purchased for several places, or you can make them homemade! This gift will really show just how excited you are for the coming little one. Hand-crocheted toys, such as little animals, aren’t just adorable–they’re sweet little reminders of the love of a friend. When making the toys, choose gender-neutral colors so it will match the baby’s nursery and clothes no matter if it’s a boy or a girl. If you know the theme for baby’s nursery, choose something to match! This is another gift that will show you care, but it won’t take up quite as much of your time. The mother-to-be will likely get lots of generic, store-purchased onesies, so make yours a bit more special. A simple white or other neutral color is best. Then use whatever fabric decorating tools you’d like and leave a special message for baby or mom. Let’s not forget that Dad may be at the gender reveal party too! And he’s just as excited or nervous as mom is. Really surprise everyone by bringing a gift for dad. He’ll likely appreciate it a lot since mom gets most of the attention. There are countless stresses that come with having a baby, whether the parents-to-be are excited or not. Take some of that stress off by surprising them with a night out on you. Dinner gift cards work great for this. As plans for baby get underway and mamma’s appetite grows, a free dinner is always appreciated. Lavender is known for its calming effects, whether in fresh or oil form. It comes in soaps, lotions, and tons of other items. Provide a vase and a bouquet of the fresh herb, or choose a bath bomb that’s filled with it. However you bring lavender into her life, mamma will likely appreciate it. This may seem like a funny gift idea, but think about it–vitamins can be expensive! And mom and baby both need them. Take some financial stress off of mom by providing some of her needed vitamins for her. Make sure you find out if mom has specific vitamins she prefers or has been directed to take by her doctor. Otherwise, mom may not be able to use them. Dad can be helpful, in these types of situations. This gift is for the serious friend who isn’t afraid to lay down some cash. New parents worry constantly about the welfare of their brand new child. You can take some serious stress off by providing a fetal heartbeat monitor. This is a gift that will keep on giving. They’ll be able to use it for every child if they have any more. And it will work just great, whether the baby’s a boy or a girl. Most guys like T-shirts, so why not bring one for dad to wear at the party? He’ll love sporting the message that he’s the man of the party. Whether you go for a simple “Dad-to-Be” shirt or something funnier like “The Man behind the Bump” he’ll love wearing it and party-goers will undoubtedly turn it into a conversation point. Every new parent needs a good cup of coffee or hot cocoa from time to time. So why not give your friends some matching mugs to commemorate their becoming parents? Simply get two white mugs and add “Mommy” to one and “Daddy” to the other. Don’t forget to include the year of baby’s birth on there too! Mom and dad still need their “us” time while baby is on his or her way. So a couples massage gift card is a perfect gift for a gender reveal party! A couples massage not only gets mom and dad out of the house for a date night. It also provides some probably much-needed relaxation that they’re sure to appreciate. There are all sorts of things mom and dad will need for their new bundle of joy. Get them started by gifting them several items in the form of a wreath! Items could include diapers, wash clothes, and any other small items that can be formed into a wreath shape. Mom and dad will probably get a lot of diapers at their baby shower(s), but let’s be honest, you can never have enough diapers. Surprise everyone by providing diapers in larger sizes. Mom and dad will likely get lots of newborn and size 1 diapers, so this a perfect gift that they’ll really appreciate later on down the road. It’s important for mom and dad to keep up their relationship during and after the pregnancy. That may not be on their minds though, with all that prepping they’re getting into! Help them take care of themselves by providing a book or other list of ways to keep that romance going. Mom and dad are both likely to lose some sleep and forget some meals in the coming months. Help them combat the forgotten food issue by providing them with ample healthy snacks. Whether they use them at the hospital, or late at night when baby wants to be fed, they’ll love you for thinking of their health. Mom absolutely needs to keep her hydration up, but it can be hard to remember or want to. Encourage her to keep on drinking by providing her with a cute and stylish water bottle. Do your job right and mom will get plenty of water because she wants to use her new container! If mom and dad have certain hobbies that might require special items for baby, think ahead and get those items for them? Do mom and dad love rock concerts or monster truck rallies? Then baby is definitely going to need some ear protection. Or if painting is mom and dad’s thing, buy or make a tiny painting apron. Baby probably won’t need it, but it will make his or her parents smile. If parents are seeking advice, and you have something helpful to say, go ahead and give it to them. This is especially helpful if you’ve been pregnant before. Be wary of this gift, though. If given when it isn’t wanted, it may just make for touchy situations. If you do plan to give advice, do so in a way that the mom and dad can accept it if they want to. Try putting it in a cute little book with one tip or though on each page. Keep it simple and fun to look at so they’ll refer to it often if they want to. Dad likely has a toolbox or two lying around the house, but he probably doesn’t have this kind. Instead, get your hands on a tool or tackle box and fill it with everything dad needs to care for baby. Some items to include could be baby lotion, baby soap, tiny hair brushes, little hand towels, and hand sanitizer. There are plenty of gifts that are appropriate and enjoyable for a gender reveal party. On the flip side, there are plenty of things that shouldn’t be brought to the party. Let’s look at a few of these items. This really just shouldn’t happen at a gender reveal party. Mom and dad are worried about enough as it is. Even if you know they plan to have more, leave the comments about future children for another time. Since mom and dad are announcing the baby’s gender, it doesn’t make sense to show up with gifts that are specific to a boy or a girl. You may think a gender reveal party is the ideal time for a toast, but in fact, it’s probably the worst time. Why? Because mom needs to stay away from alcohol. Bringing alcohol to the party will only make mom feel left out or tempt her to take some when she shouldn’t (if she’s a drinker), so just don’t bring it. It doesn’t matter if you’re the biggest prankster or sarcastic soul around, don’t give the couple anything or say anything about how they won’t be good parents. Even when said in joking these comments can really hurt. Don’t strike up a conversation about all the worst things that happened when you were pregnant or had a new baby. The last thing mom and dad need are stories to have nightmares and anxiety about. Instead, fill them with happiness and anticipation–they already know that new learning experiences and safety hazards are ahead. Mom needs to keep her body and teeth healthy, so don’t load her up with sugar. Just don’t do it, even if sweets are her favorite thing. If you do want to provide snacks and treats, choose healthier options. You can always provide recipes for healthy alternatives, too, such as black bean brownies. Whether you plan to bring a gift to the party or not, it’s always polite to offer to help. This doesn’t mean get up in mom’s face with all your great ideas and crazy enthusiasm. Instead, politely offer to help if she needs or would like it. Planning a gender reveal party can be lots of work, but it doesn’t have to be. If mom needs and wants help, help her create a party that’s simple but unforgettable. Each of these gender reveal gifts is guaranteed to make mommy and daddy smile. From practical and helpful, to fun and exciting, there’s a vast array of gifts you can give. Make sure your gift doesn’t fall into the “don’t give” category, and you’ll be good to go. Whether baby ends up being a boy or a girl, mom and dad will love remembering that you came to the party each time they use your gift. Does mom want some help planning her party? Check out our ideas for a party she’ll never forget!